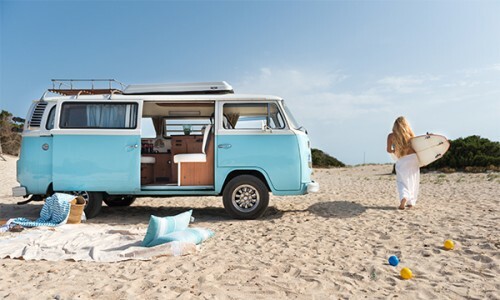 This page displays all the campervans that are available for hire in spain . If you would like further information or to speak to the camper's owner about hiring their van please visit their Camperbug page, by clicking below. I am BlueVicky, hire me today! My name is BlueVicky and I am a beautiful Volkswagen Bulli Westfalia T2 \"Berlin\" classic.I am white and turquoise blue like the sea. I love my elegant wooden steering wheel and my impeccable 1800cc engine. You will recognize me for my tires so striking and the \"mushroom\" roof. I have a sofa bed and even an original Westphalian kitchen.You can hire me to surprise you in the most special events like weddings, inaugurations, street marketing campaigns, blog trips, gastronomic events, activities in nature and experiences in incentive groups.You can also rent me to discover the island of Mallorca. Sleep and drive. Wild will take you anywhere you want, to wild beach, to city center, any where your imagination will lead you. It will allow you to park at the museum, restaurant or on the edge of the escarpment. Surfer comes witch 2.0 L turbo diesel engine. In conjunction with each of the 5-speed manual, it is capable to make 116 horsepower. We are based in Southern Spain Malaga Have lots of fun with Loli, enjoy your holiday with our fully equipped Loli VW T3 Camper. If you are looking for a relaxing and stress free holiday touring Southern Spain, then look no further. Take our T3 for a spin in the Sierra Ronda above Malaga. Explore at your own pace, all the attractions Spain has to offer, sleep when you want, eat when you want, move on when you want. The VW T3 (T25) Joker is a benchmark in the world of Camper. With a turbo diesel engine and an interior with all the comforts, its performance is almost equal to a current van, also having a unique classic touch not at odds with the Air Conditioning. Mentawai is a� Great campervan VW T6 based in Majorca, ready for you to discover the whole island or the others Balearic islands. The van is equiped for 4 people sleeping and will give you the chance of having an incredible experience. Maori is a Great campervan VW T6 based in Majorca, ready for you to discover the whole island or the others Balearic islands. The van is equiped for 2 people sleeping and will give you the chance of having an incredible experience. Fully equipped left hand drive delivery at girona or barcelona airport low cost fees apply ,with solar plate ,complete bath with hot water system ,radio heater etc.